Which West of England aircraft and engines have been most memorable or significant, in your opinion, and what impact has the industry had upon the city-region and further afield? Until the small amount of research I have done, I had no idea about the huge debt the West Country owes to the Aviation Industry; the fact that Concorde is housed at Filton; the fact that the Bristol Aeroplane Company initiated the development of the aeroplane in the first place is an amazing piece of history that should be shouted from the rooftops. Britain is forever doing itself down....we need to shout a little louder about our remarkable heritage. BAC has been at the heart of the community in Bristol and surroundings for 100 years. It was essential to our survival through two world wars and success in numerous smaller wars. It gave birth to the world's only supersonic transport aircraft and is the UK's only modern participation in commercial aircraft. It also played a major part in developing this country's contribution to space exploration and to missile defences. Through the current Airbus partnership it has fostered links with not only our long term allies in France but with our erstwhile enemies in Germany. I found it moving to visit colleagues there who still live in the houses in which their parents lived during our bombing raids. In one case, the only house left standing in that street. Bristol is a centre of engineering, one of the homes of British aviation, and a centre of innovation. Apart from all the great aircraft designed and built here, there are the contributions to engine technology. Those splendid sleeve valve piston engines, the invention of the free turbine (the technology which virtually every major jet engine today relies on). Don't forget that the technology which made the Harrier possible originated in Patchway at Bristol Engines. Bristol has been a leader in the development and technology of the aerospace industry for many decades, with the major companies, academic centres and the numerous subcontractors involved in major projects. The many peoples employed have together demonstrated high levels of skill and dedication over the good and sometimes difficult times achieving results beyond expectations, which has helped to facilitate the growth and prosperity of the area as a whole. 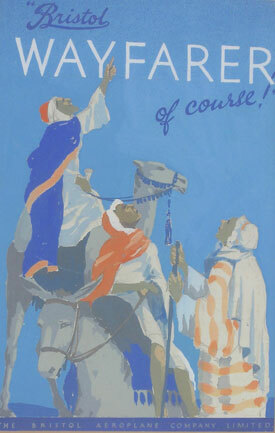 Wayfarer advertisement, c 1950s (Bristol Aero Collection).